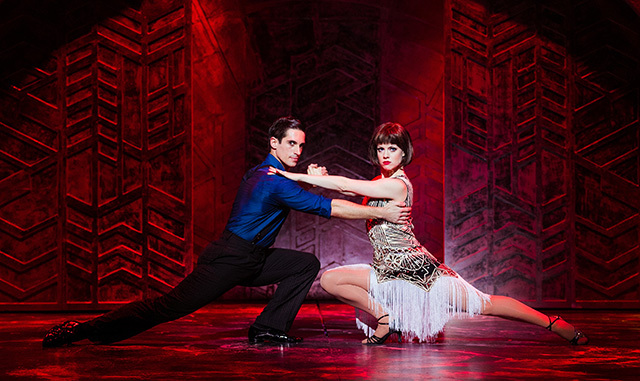 Thoroughly Modern Millie shimmies into Leeds Grand Theatre this week as part of a national tour. Made famous by the movie adaptation featuring Julie Andrews, the tale of a dizzy flapper in Twenties’ New York returns to the stage, now fronted by Strictly Come Dancing champion Joanne Clifton. Millie Dillmount is a Kansas girl with ambitions for fame and fortune in the Big Apple. After losing her possessions in the city, she falls into a sinister hotel run by the bizarre Mrs Meers. Joining a troupe of other aspiring modern girls, Millie seeks to find a wealthy husband to secure her success. Meanwhile, Mrs Meers is secretly abducting residents one by one in a fiendish underground slave exchange. Can Millie find her man, or will she end up on the shelf in Hong Kong? A dark runabout comedy punctuated with upbeat jazz numbers, Thoroughly Modern Millie scores big laughs in a substantial production, showcasing roaring Twenties arrangements and energetic dance routines. Rob Wicks’ musical direction is bright and dynamic, driven with blasting brass exclamations and a frantic ukulele rhythm, perfectly complimenting a plethora of lighthearted slapstick. Standout numbers include The Speed Test, an impressive exercise in rapid-fire dialogue, in addition to Only in New York which provides Jenny Fitzpatrick the opportunity deploy a stunning showstopping solo. Racky Plews’ direction ensures there is an authentic quality to song and dance numbers, which smoothly transition between scenes of knockabout comedy and light romance. Graham MacDuff excels in raising the roof as the perfect inebriate; milking a perilous swagger and indistinguishable slur for all its worth. Lucas Rush as Mrs Meers is also an irresistibly evil delight, edging towards pantomime in his grotesque parody of a Chinese hostess. Marios Nicolaides and Joanne Clifton. Photographer: Darren Bell. Sam Barrett is a dependable and arresting cad as Jimmy Smith and the perfect partner to Joanne Clifton’s Mollie, who excels in leading the ensemble with meticulous form in dance and a bright vocal clarity. Perfectly cast, Clifton’s command of slapstick and charm as the bubbly and volatile Millie Dillmount is wonderfully pitched between clumsy, cute and cool. The production also offers and indelible set design, brimming with Art Deco angles and innovative cutaway locations, issuing a comic strip feel to scenes. Lighting is also evocative and complimentary to the period, avoiding unnecessary anachronistic effects. A projection screen with subtitles is a smart little touch, providing something of a silent movie caption effect to the comedy. Coupled with a roaring arrangement, ambitious choreography and jewel-like costumes, Thoroughly Modern Millie is an all-round stylish and well-realised production. Glitzy and glamorous, yet sleazy with a decidedly dark undertone, Thoroughly Modern Millie is a razzle-dazzle evocation of the roaring Twenties. Oozing charm, sass and style, this is a musical which delivers plenty of song and dance for your dollar. Cast: Joanne Clifton, Lucas Rush, Sam Barrett, Graham MacDuff, Jenny Fitzpatrick, Katherine Glover, Damian Buhagiar, Andy Yau, Catherine Mort. Director: Racky Plews Writer: Richard Morris Theatre: Leeds Grand Theatre Duration: 145 minutes Dates: 17th April – 22nd April 2017.